The proverbial Montana home – thinking log? Think again. Home designer and builder Tim Wilkinson was born and raised in Montana and his latest home reflects the free spirit and originality of the West by breaking free of the cliché Montana home. He recently completed what he describes as a “Montana Modern” home in Spring Tree Ridge, one of Wilkinson’s housing developments located three miles outside of Great Falls overlooking the Missouri River and to the Highwood and Little Belt Mountain ranges. Wilkinson says that the home is not ultra-modern even though it has contemporary elements. He says, “The theme of the home is modern contrasting with rustic industrial.” A theme that you discover at the entrance where a handsome and rustic custom steel door provides a striking contrast to the clean lines of the exterior finished in stucco and gray stone called “Montana tumbled black rundle,” quarried near Three Forks. 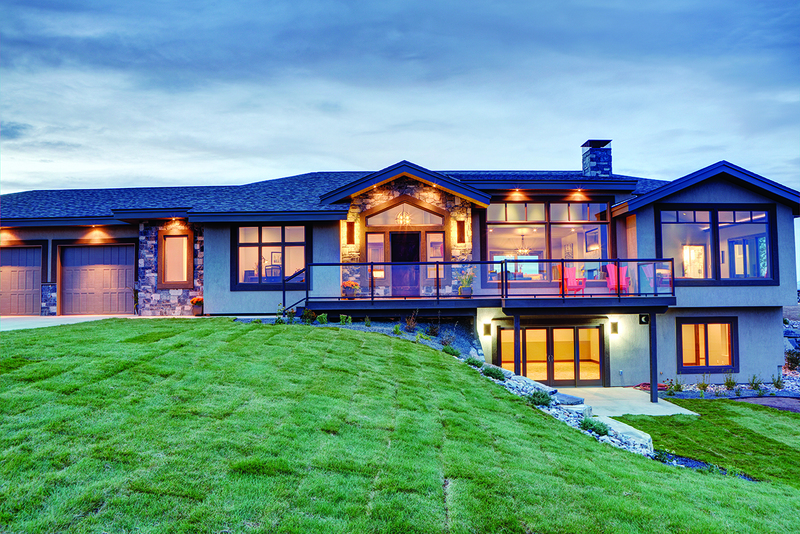 When you enter this Montana home you will find it to be sleek, comfortable and current with the elegant blending of stone, wood, metal and cutting edge product lines. The four-bedroom home carries the Wilkinson Homes stamp with most of the work from start-to-finish completed by the design/build company. The kitchen cabinets were built in-house at Wilkinson Homes crafting figured cherry wood panels finished with a soft, gray wash. The unique fireplace is just one way that Wilkinson redefines a Montana home style, using bronze riveted steel with a rusted wall bump out. A spacious kitchen is furnished with professional grade appliances from Eklund’s Appliance and TV, which includes a unique horizontal arrangement of three ovens. All the key components lie in close proximity to an island topped with a Thermador professional range and lit by European style golden pendants in a kitchen design that delivers both style and function. The kitchen also features a walk-in pantry and stunning countertops made from white quartz with gray veining similar to Carrara marble, but with the advantage of being more durable. Montana Marble and Granite fabricated and installed all the countertops in the home. The Master Bedroom and two bedrooms are found on the main floor, with the fourth bedroom located in the walkout basement along with a home theater, family room and exercise room. Tim says he went for a spa atmosphere in the master bathroom. The airy room features a glass-enclosed shower with a chiseled edged travertine floor and a modern stand-alone tub. The bath and bedroom were designed with large windows to take advantage of the fantastic views and natural light. One of the main floor bedrooms was furnished as an office and has a 1953 carpenter’s desk as its centerpiece. The desk was in Tim’s father-in-law’s home for 40 years and originally used by another longtime Great Falls contractor. A contemporary sliding barn-style door distinguishes another bedroom. A gray-toned walnut wood flooring flows through the kitchen, dining and great room area. The durable engineered flooring from Floors and More carries a 50-year warranty. The prominent shades of gray used in paint and materials contrasted by yellow and orange accents echo a cloudy day punctuated with splashes of sunshine. Tim’s sister Vicki Haines completed the interior design and staging of the home. The use of orange was inspired by striking photographs of a bright orange streetcar and other vintage vehicles that provide a bold, warming effect in the home. A Sonos wireless HiFi system, installed by Jim Schilling of Sound Pro/Good Vibrations, streams music throughout the home. This technology uses Wi-Fi to offer a greater range, the ability to work with multiple devices including computer, smart phone or tablet and the option of playing different music in different rooms. A glass railing on the front deck was designed so as not to obstruct views. A back deck overlooks a fire pit with a rustic steel enclosure and circled by a pad of gray crushed rock. The massive rock slab benches result in a striking artistic element in the outdoor focal point. The home, which is being offered for sale, was recently featured in the Parade of Homes and swept the over $500,000 categories including Judges Choice, Craftsmanship. Best Kitchen, Best Master Bath, Best Floor Plan, and Curb Appeal. They also won the Peoples Choice, a nod that this is indeed a new kind of Montana home. A love for words and pictures led Kay Bjork to a career as a feature writer and photographer for numerous newspapers and magazines. Her home and family on Swan Lake have been the subject of many of her stories and photographs about their outdoor adventures including skating, skiing and hiking.